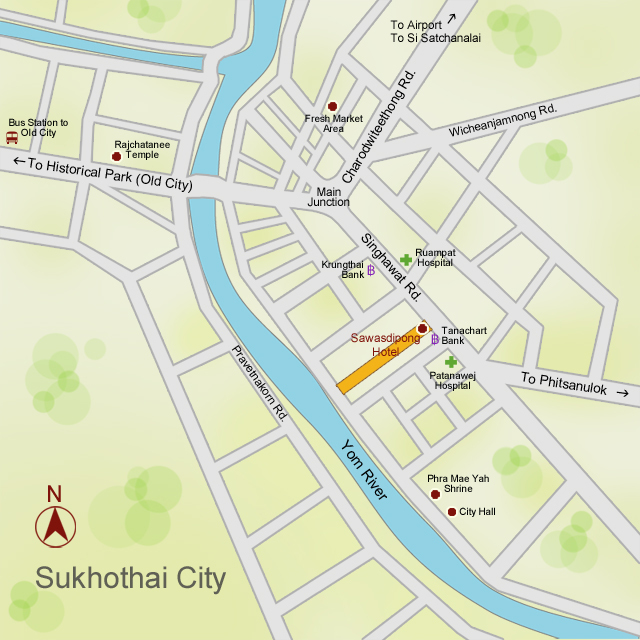 Arrive Sukhothai by Plane : The airport has airport vans that take you to your hotel and bring you back to the airport for departure. Just make sure that you register with them when you arrive at the Sukhothai airport. The fee is around 300-500 Baht per person. Arrive Sukhothai by Bus : There are plenty of motercycles and tricycles (Sam Lor) available at the Bus Station. Please tell them to go to "Rong Raem Sa Wad Dee Pong" or just click here and print the name of our hotel in Thai. The fee for motercycle and tricycle to the hotel will be only around 20-30 Baht. However, our hotel also has a pick up service with at 300 Baht per person. Please let us know when you make a reservation as well as inform us of your arrival details so that we can arrange the pick up for you..